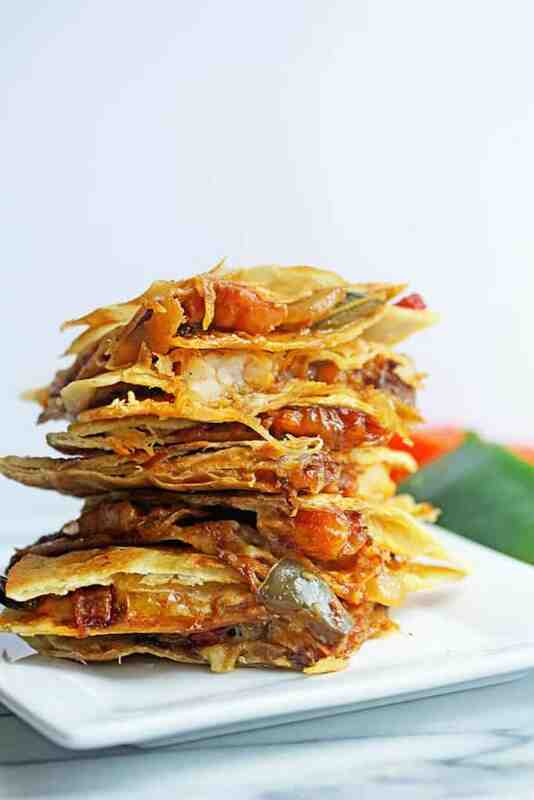 These sensational Shrimp Fajita Quesadillas will rock your world. Butter brushed tortillas get a healthy and flavorful filling of shrimp, onions and diced peppers in this addictive recipe. ​Quesadillas were my go to meal in college. Fast, easy and oh so delish! I couldn’t get enough. My favorite recipe combined both pepper jack (for a spicy kick) and cheddar (sharp to be exact). Those two cheeses melted between two buttered quesadillas was all I ever craved. Now that I’m older, I still love my quesadillas but with a bit more unique flavors. 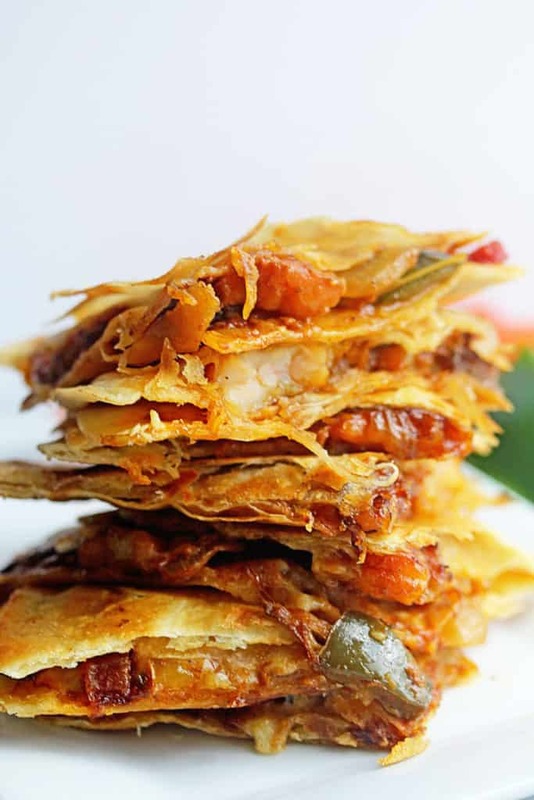 These Shrimp Fajita Quesadillas were a brainchild that ​ I started with this easy yet ​delish classic quesadilla recipe from BHG.com but punched up the flavor. I added diced green, red and yellow peppers, onions and shrimp to the insides of the basic quesadilla recipe with a pepper jack cheese and they were sensational! There is also fajita seasoning in there that really takes this over the top. I’m in love. If you want to be in love too, check out the Shrimp Fajita Quesadillas recipe on BHG Delish Dish now! Uhm, I could eat quesadillas every day for the rest of my life and die a very very happy man. LOVE. Get in my belly! I love a cheese-oozing quesadilla. These look amazing! Oh my word! Drooling over these!!! Goodness gracious that looks so good. I’m hungry too. This isn’t fair,showing food that looks so good right at lunch time . Nothing I make will compete. These look delish!! I can so go for quesadilla dinner tonight girl! Fajitas are what I order when I go to Mexican….. They are just so dang good, mouth watering, juicy… AMAZING! So yes, I will be making this,minus that tortilla/wrap… Although I could totally use cabbage! Just the pictures are rocking my world, so I can only imagine the flavor. Omg fajita quesadillas!!! Two of my most favoritest things in one. Swoon! These quesadillas look incredible. Pepper jack cheese is so good and sharp cheddar cheese is always in my fridge. I like my cheddar to be extra sharp with a bite to it. We are huge quesadilla fans at our house Jocelyn! These look crazy good!! Pinning! I was toe-ts addicted to quesadillas in college too! Quick, cheesy and delicious! These take my former addiction to a whole new level of yum! Love the flavors and the quesadillas meets fajita concept! Pinned! Cheers, girlfriend! What is it about college and quesadillas? I don’t eat quesadillas often. I think I’d eat more of them if they were shrimp fajita quesadillas. These look fantastic! You should totally change that hon. So I did stop in to see the entire recipe on BHG because I simply could not resist! I am always looking for a quick meal to satisfy all, this is just the ticket. It totally is! Super quick and easy. Holy. Freaking. WHOA. LIIIIKE, I am majorly obsessing over these in a MAJOR WAY. Did I say that already? Don’t care. TOTALLY need these! Pinned! Damn girl, these look finger licking amazing! These would rock my world! I love quesadillas and fajitas, so this is two of my favorites in one! Yes they are the bomb Marcie!! Girl it is time to change that! I love having shrimp burrito and I’m sure this quesadillas tastes amazing too! Love every bite and crunchiness! The bite and crunch are so addictive! Yep I am totally craving quesadillas now too! !